Behind-the-scenes in College Chemistry 1 (Chem 111). Inside the classroom: Students heat, mix and measure various compounds to learn about chemical properties and concepts. 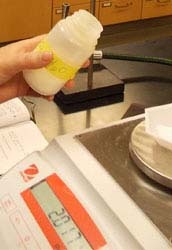 During this experiment, students at the Norfolk Campus heat Magnesium Sulfate to remove the water from the samples. Once the samples are completely dry, students determine the percent of water in the samples to derive the hydrated formula for the salt – which in chemical terms is MgSO4·7H2O.